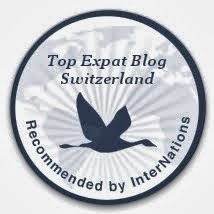 erniemcpeck - Adventures in Switzerland: Growing up too fast? ﻿﻿﻿﻿﻿﻿It's been a whole month since my last post. Lydia is now three months old and seems to change a little bit with each passing day. Time has simply flown by, and I am beginning to understand why people always say you should enjoy every moment with your child because they will be grown up before you know it. Ok, so Lydia is still a baby. It's not like she has suddenly started walking, dressing herself, taking whatever she wants out of the fridge, and so on and so forth. She still needs us to do everything for her, and as such is still as helpless as the day she was born. However, she is growing up fast. Over the last few weeks since my last blog entry Lydia has started to get much stronger. We can see her trying to sit up a bit whenever we have her laying down in our arms. She is also getting closer to being able to roll over. We lay her down on her back, she kicks her legs up in the air and rolls onto her side. At the time of writing, she hasn't quite managed to roll all the way onto her front yet, but I think that will come in the next few days. She is beginning to take much more interest in objects that are near her. At the end of June I bought her a new toy as a treat for being such a good girl during her first vaccinations, and this toy was a soft elephant with an elongated body and a squeaker inside. I placed the toy on Lydia's stomach while she was sitting on her baby chair, and she managed - for the first time - to bring the toy to her mouth with her arms. Since this moment, any kind of object that comes near her mouth is soon treated to a baby cuddle and a generous helping of baby saliva. These little changes might not seem like much to someone reading this blog, particularly those who do not have children of their own, but to us it is just amazing to see how our little girl is progressing all the time. She smiles at us all the time now, and we can tell that she can't wait to be more independent as she seems to get annoyed that she isn't able to sit up by herself at the moment. As soon as she can sit up and play with her toys, I think she will be incredibly happy. As a parent and proud father, nothing makes me happier than seeing my daughter smiling. We're all off to England next week for my brother's wedding, and I can't wait to show Lydia off to all our family over there. We have picked her out a nice little dress, and I'm really looking forward to seeing everyone's faces as they see our little angel all spruced up for the big day. Let's just hope Lydia saves some smiles for the wedding photos!